The damaging effects of multitasking in Software are no huge surprise; they’ve been covered by gurus like Joel Spolsky and Jeff Atwood. Atwood references the multitasking research of Gerald Weinberg, the consultant’s consultant. One common ‘fix’ to eliminate multitasking is to reduce Work In Progress, something we talk about at my company in presentations, in our courses, and yes, right here at Uncharted Waters. So when I see a tweet like the one below, you can image it causes a strong reaction. 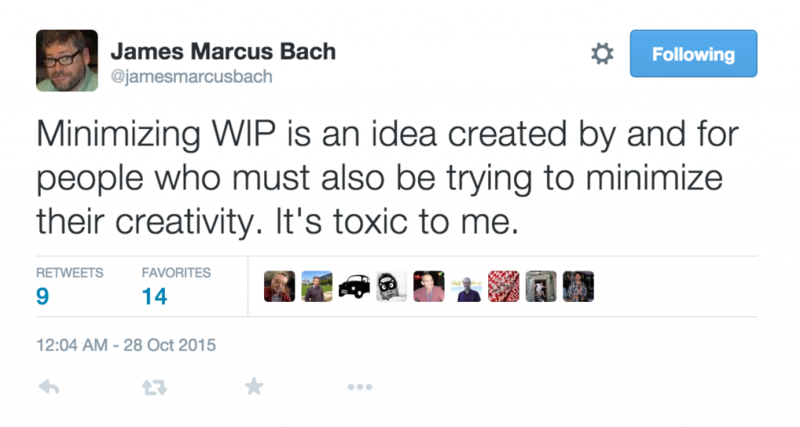 After a fair bit of back and forth with James, I have a bit of the context and I can at least agree that minimizing WIP can limit creativity for certain kinds of work, and could be toxic to certain kinds of creativity. Let’s talk about what those might be, starting with my own work. Yesterday I got back to my office after a three-day trip; last week it was a four-day trip. Correspondence, shipped items, and items I had removed from my backpack in order to free up space cluttered the desk. This is what it looked like after ten minutes of cleaning – enough that I could actually put my laptop down and sit in the chair. You’ll notice it is a bit cluttered. Finding things can take some time. A few years ago, a friend of mine, a Six Sigma Black Belt, walked by my desk and shook his head. 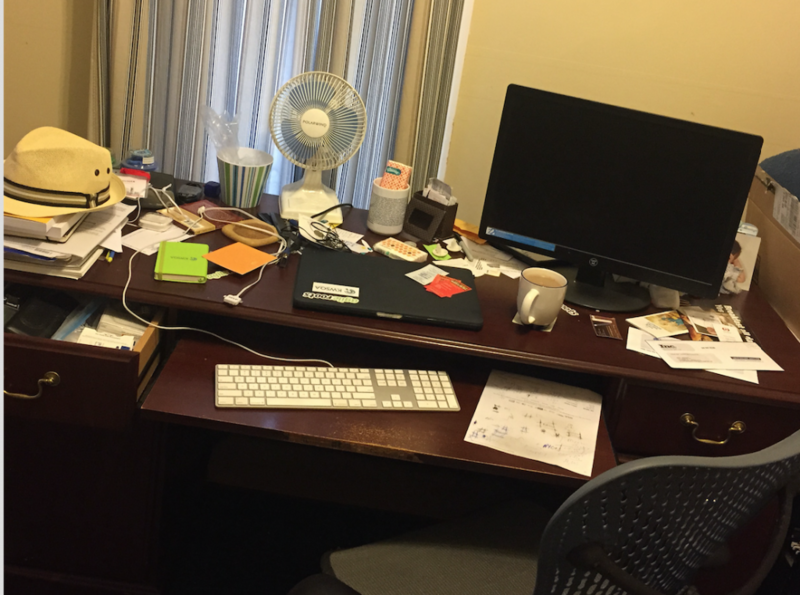 He explained that if I only had a cleaner desk, a more organized work process, why, I’d be so much faster! I asked how many articles he produced last year: He said two. I asked how many hours of new material he developed a year, and it was an hour or so every year or so. And books? He was striking out at zero. My output was … higher than that. So he pointed out that if I only organized, imagine how much faster I could be! It sounds right, and yet … I don’t think that is how intellectual property is developed. I’m no psychologist, and certainly not a neural scientist. Still I expect we all can agree that if you give someone a subject and say “be creative! Be Creative! Focus on only this thing!” you are unlikely to get the results you’d hoped for. If software development is knowledge work, then, isn’t WIP limits a prescription for sloppy, unthinking work? My friend and mentor, Ken Pier, once told me that the folks at Xerox PARC were in roughly two camps: The intellectuals that came up with big ideas and developed a proof of concept, and the engineers that did the spade work to bring it to market. Ken was an engineer, and that was how he did well at PARC without a PhD. Johnny Lee, for example, hacked the wii game controller to create a head-mounted 3-d viewer that could respond to movement in 2007. And then … he stopped. The hard, creative work, the research was done, what remained was the development, which he doesn’t seem interested in. Lee open-sourced the designs and moved on to the next thing. I’d go so far as to suggest that the culture and commentary above, about the advantages clutter, of working on more than one thing at a time, of dropping something to letting the unconscious mind work, and of forcing the brain through a different and unusual set of neurotransmitters in order to kickstart ideas – all that applies to research. When we talk about limiting work in progress, we typically mean development – James’s work-products are often intellectual property, books and instructional materials. One could argue that James makes his living creating new ideas (R-heavy) and capitalizing on them. With that argument in mind, the “toxic” quote seem to make sense. Yet a lot of software is Development – build this straightforward thing – where WIP limits can add demonstrable value. Sometimes the difference is not so clear. Consider software testing, which most consider a strong “D” activity. Yet, within the test community, there is a general acknowledgement of black swan problems, the kind that are big, bad, seem easy to find in hindsight but are often hard to see with foresight. We recognize these are hard to see, and often they are only found up front through serendipity, by accident, or through creativity. That sounds kind of “R”-ish, doesn’t it? In my experience, many true product innovations come up from the development team – including breakthroughs in user interface, work process, and test ideas. If we focused on limiting WIP, cranking out as much value as possible, we would miss these opportunities. Luckily, that’s not what we do. 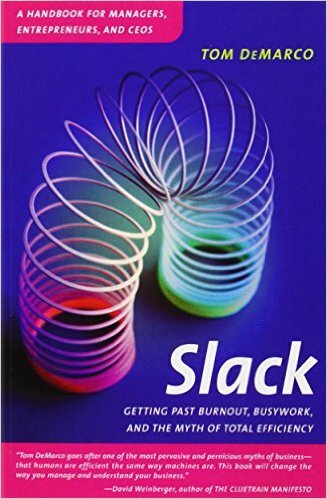 Tom Demarco’s book Slack: Getting Past Burnout, Busywork, and the Myth of Total Efficiency introduced the idea that the slack time – unplanned time – is where a great deal of innovation comes from. DeMarco was focused on the middle management layer, but this applies to development teams as well. In our Lean Software Delivery course, we don’t pursue resource utilization – trying to keep everybody busy, all of the time. Instead, we teach that reducing waste trumps resource utilization, that improved flow trumps removing waste, and, finally, that value for customer trumps improved flow. To find that value for customer we suggest slack for at least three reasons – To improve response time, for innovation, and for morale. So yes, there may be circumstances when letting WIP expand gives you that key idea you need to go forward. And there may be times when limiting it helps you get work done faster. Most of the time, just reserve a little slack. So go ahead, let yourself take a walk. As for the crushing machine begging for productivity now, don’t worry. I’m sure it will be there when you get back.